Nature and human beings exist in a perpetual bond, the outcome of which is never predictable. The confidence in the technological mastery of nature prevalent in the first two-thirds of the last century is seriously questioned by many people today. Natural disasters defy the engineer with unexpected and often cataclysmic destruction. At the same time, nature still inspires a sense of wonder that calls us to its defense in the face of our own destructiveness. For landscape designers especially, nature is an indispensable partner. This series consisted of four talks on the nature of good place-making. woodland observation in a series of photographs showing the transformation of particular landscapes through the seasons and over time. He discussed the influence these images have had on his design of gardens. Tony Hiss presented the startling findings behind his most recent book, H2O: Highlands to Ocean, which show that despite four hundred years of nonstop growth in the New York City area, so much spectacular natural land and water survive that everyone here has two addresses: a street address and a place in the larger landscape. Parkways combine recreation, transportation, and natural resource protection in landscapes specifically designed to promote the enjoyment of scenery in motion. This conversation with Tim Davis traced the evolution of the American parkway and highlighted contemporary management concerns. 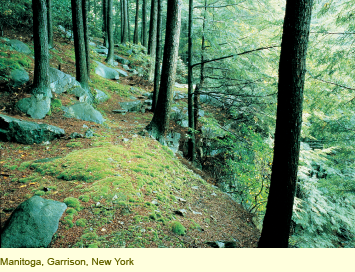 Carol Franklin, a landscape architect, reflected on how existing and future park systems based on rivers and their tributaries protect regions, cities, and neighborhoods from the worst effects of urban sprawl: destruction of natural areas, a general loss of urban character, and homogenization of the suburban landscape.